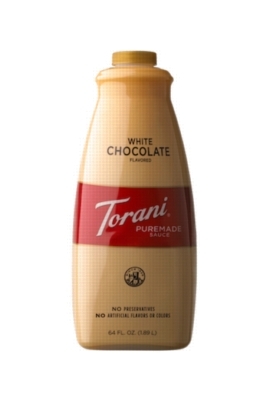 Torani White Chocolate Sauce is a creamy, dreamy expression of fine white chocolate with cocoa-buttery-vanilla undertones. Add it your favorite beverage or dessert. INGREDIENTS: Sugar, water, sweetened condensed skim milk, invert sugar, nonfat milk, cocoa butter, natural flavors, salt, mono- & di-glycerides, potassium sorbate (to preserve freshness), soy lecithin, carrageenan gum.